In the present day, Odense remains the commercial hub of Funen, and has a notable shopping district with a diversity of stores. Several major industries are located in the city including the Albani Brewery and GASA, Denmark's major dealer in vegetables, fruits and flowers. The city is home to Odense Palace, erected by King Frederick IV who died there in 1730, the Odense Theatre, the Odense Symphony Orchestra, and the Hans Christian Andersen Museum, situated in the house that was the birthplace of Hans Christian Andersen. 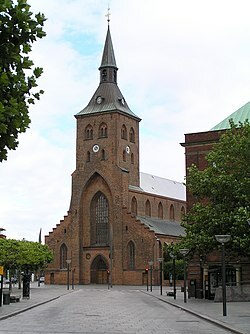 In sports, Odense has a number of football clubs including OB, BM, B1909, and B1913, the Odense Bulldogs professional ice hockey team, and the city also hosts the H.C. Andersen Marathon. Odense is served by Hans Christian Andersen Airport and Odense station, which lies on the line between Copenhagen and the Jutland peninsula. ↑ अ आ "Odense Universitetshospitals historie – kort fortalt" (डेनिश में). OUH. अभिगमन तिथि 2 July 2014. ↑ "Research". ओडिन्से यूनिवर्सिटी हॉस्पिटल. अभिगमन तिथि 1 July 2014. ↑ "Odense's tallest buildings – Top 20". एम्पोरिस. अभिगमन तिथि 2 July 2014. ↑ "Twin Cities". ओडेन्से नगरपालिका. अभिगमन तिथि 11 July 2014. ↑ "Partnership". कौनास इंटरनैशनल रिलेशन्स. अभिगमन तिथि 18 November 2011. एंडरसन, जेस्पर एच. ; कोन्ली, डैनियल जे. (30 May 2010). Eutrophication in Coastal Ecosystems: Towards better understanding and management strategies. स्प्रिंगर. आई॰ऍस॰बी॰ऍन॰ 978-90-481-3385-7. बेन, कैरोलिन; बूथ, माइकल; पर्नेल, फ्रैन (2008). Denmark. लोनली प्लैनेट. आई॰ऍस॰बी॰ऍन॰ 978-1-74104-669-4. बूथ, माइकल (1 January 2003). Time Out Copenhagen. Penguin Group USA. आई॰ऍस॰बी॰ऍन॰ 978-0-14-100839-4. बेडेकर, जैरोल्ड; प्रेस, जैरोल्ड (1 May 1990). Baedeker's rail guide to Europe. प्रेंटिस हॉल प्रकाशन. आई॰ऍस॰बी॰ऍन॰ 978-0-13-055971-5. ग्रिफ्ल्स. Baltic Sea (Southern Part). प्रोस्टार प्रकाशन. आई॰ऍस॰बी॰ऍन॰ 978-1-57785-762-4. हार्डिंग, पॉल (2009). Scandinavian Europe. लोनली प्लैनेट. आई॰ऍस॰बी॰ऍन॰ 978-1-74104-928-2. लार्सन, लौरेंस मार्केलुस (2014). Canute the Great The Rise of Danish Imperialism during the Viking Age. बूकपबर. लौरिडसन, जॉन टी. (2007). Over stregen – under besættelsen (डेनिश में). गिल्डेनडाल ए/एस. आई॰ऍस॰बी॰ऍन॰ 978-87-02-05199-5. रेनुफ़, नॉर्मन (2003). Copenhagen and the Best of Denmark Alive!. हंटर प्रकाशन. आई॰ऍस॰बी॰ऍन॰ 978-1-58843-355-8. थेस्ट्रुप, पॉल; एंडरसन, डोरिट; ओक्सेनवाड, नील्स (1986). Odense bys historie. Mod bedre tider. Odense 1789–1868 [History of the city of Odense. Towards better times. Odense 1789–1868] (डेनिश में). Odense Universitetsforlag. आई॰ऍस॰बी॰ऍन॰ 978-87-7492-610-8. विकिस्रोत has the text of the 1911 ब्रिटैनिका विश्वकोष article ओडिन्से.